Gemini Pinnacle of Gemini Infra India, a luxurious and prestigious residential development having 2BHK apartments is available in the rapidly expanding residential vicinity of Hyderabad. What is the project location?The project is located at Pragati Nagar, Hyderabad. What is available flat size in Gemini Pinnacle? 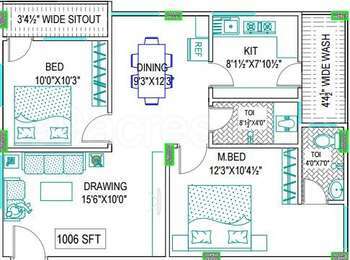 Flat sizes in the project range from 1001.0 sqft to 1006.0 sqft. 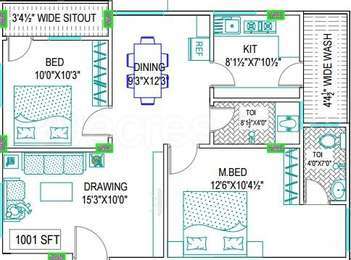 How much is area of 2bhk in Gemini Pinnacle? 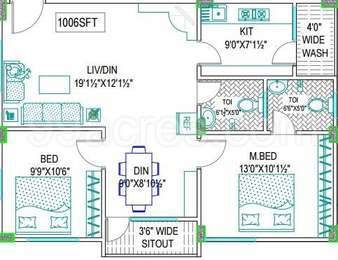 Two-room units (2BHK) in the project are available in an area of 1001.0 sqft to 1006.0 sqft. How many towers are there in Gemini Pinnacle? There are 1 towers in the project, which offer a total of 16 housing units. Does Gemini Pinnacle have lawn tennis? The project doesn't have lawn tennis. Is there a club house in Gemini Pinnacle? The project doesn't have a Club House.